Earth, a planet that was always occupied with revolting humans, karma crept into existence and crushed it. Human's fell in an abyss of distress and with what used to be Vajrapani City was now a vacant land of demolished buildings, malformed roads, side walks, and everything else man made. There was only one enigmatic life form left in the city of ruins, but it was safe to say the entity wasn't human; she stood at the front of a white plane, located on its jagged roof. The four-hundred year old woman was demon, she possessed a fragile frame that stood 5'6, and weighed 114lbs. Her face reflected benevolence, and shyness; unfortunately that was a polarity because Kikyo's presence was associated with massacre. Her deficiency for empathy made it easier to quash the human civilization. Despite the abominable orders she regularly received from Lucifer, Kikyo was experienced with fabricating her aberrant views, and emotions on humans, demons, angels, god, and her master. There was magnitudes of dismal events when she first began her line of work for the under world, deep down Kikyo knew and felt what she did was wrong. Due to the life she was born into, there was no positive alternatives. Kikyo had two options, listen or die; What she did to live was disgusting, but who was to say she was evil, or good? While calmly standing under the beaming sun's lukewarm aura, not a stream of wind blew on the summer after noon, drips of amaranth shaded blood collapsed on the plane's hood. 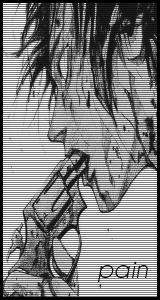 The blood dropped from Kikyo's serrated steel blade, one glance at the drooling weapon and anyone, or anything could feel repugnance, because it was an eldritch site for anyone's eyes to feast on. The sword she wielded had a blade of 30 inches in length, a width of 6 inches, and a mid-night blue wrap that was conjoined on the sword's 10 inch handle. The tsuka's (handle) base greeted a golden tsuba (guard) that was durable enough to block multiple sword thrusts and strikes, however, taking full on assaults would not be smart, it would have lead towards the tsuba's destruction. To use such a small guard, one needed perfect timing, and a good sense of physics. Keeping the tsuba in place was its 5 inch habaki (blade collar), this reinforced the tsuba by six times, so even if it was fragile, based on Kikyo's prowess as a swordswoman would depend if the guard would shatter or not. Besides the weapon's dull features, the entire frame of the sword's blade had an onyx hue, while its ridges and grain were crimson. The name of the man slaughtering tool was Tekketsu - てっけつ (Blood & Iron). Though Kikyo was an elderly woman, her appearance resembled a tantalizing twenty-three year old. Her athletic structure was similar to an hour-glass, the woman's breast size were double D, her hips and thighs were thick, simply put, Kikyo was a seductive woman. Besides her sexually attractive features, she had long, beautiful, dark brown hair that was wrapped in a pony-tail. The length of her hair was able to reach the back of her thighs. Even with Kikyo's hair being a liability for loss, or death, she was skilled enough in her art to avoid such things. The assassin's enthralling, golden irises encircled her black pupils. Formed around the eyes was Kikyo's smooth, and flawless, peach skin. Her attire looked military oriented, it was interesting for her to wear as well, considering she was a demon. 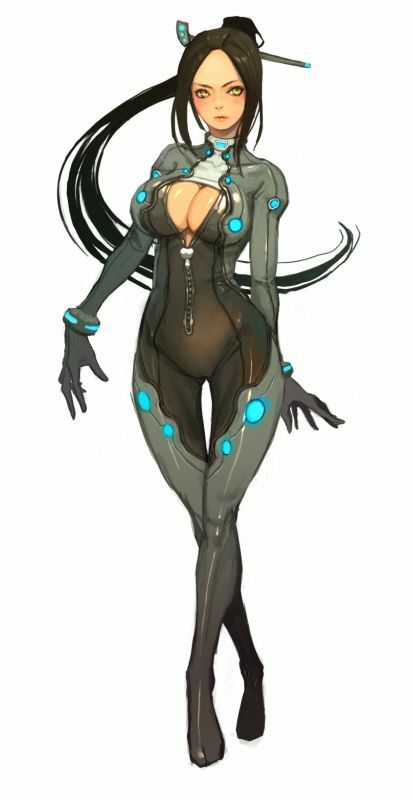 The power suit she wore enhanced her demonic physiology in two areas, the first was flexibility, while the second was agility; it made her swift and graceful movements while being engaged in combat beyond a jaw-dropping site to see. Kikyo was located on a plane that was being over-come with green moss, grass, and three trees which were thin enough to be considered bamboo, and could be used as staffs. 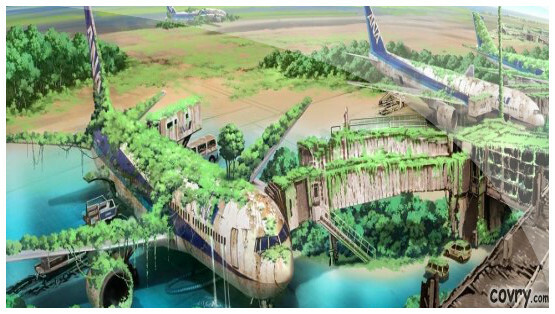 Below the plane was a lake that had a radius of seven meters, outside of its range was grass, dirt, and concrete. The clear view of land that was walk-able expanded 5 meters out to an endless forest.